England - Maverick Vinales rode a masterful race to secure his first MotoGP victory, easing to take the chequered flag in the British Grand Prix at Silverstone on Sunday. The 21-year-old - the 2013 Moto3 world champion - gave Suzuki its first win in the British edition in this category since American Kevin Schwantz in 1994. It was their first in the category overall since Chris Vermeulen triumphed in France in 2007. Vinales led home Honda's Cal Crutchlow - the first Briton since Barry Sheene in 1977 to take pole - with legendary Valentino Rossi third on his Yamaha for his 217th podium placing. Rossi marginally reduced Marc Marquez's lead in the overall standings, the latter holding a 50-point advantage over the Italian, 210 points to 160. Vinales, winning his 17th Grand Prix in all categories, said he had felt all weekend something special was on the cards. 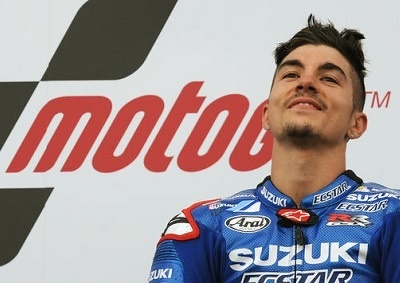 "This is a dream come true, one I thought was possible this weekend," said Vinales, whose win makes it seven different winners of the last seven MotoGPs. "I hope I can deliver more dreams to Suzuki in the future as the team has worked so hard." Crutchlow, whose win in the Czech MotoGP last time out was the first by a British rider since Sheene in 1981 in the top category, said he couldn't have wished for more. "To take pole and finish second is more than I could have dreamt of. I thought I would finish in the top six at best," confessed the 30-year-old. "I am really happy I could satisfy the home crowd as they have supported me through thick and thin down the years. "It was great fun to be battling away with the guys in front." For the as always exuberant Rossi he was satisfied to have at least not allowed Marquez to stretch his imposing lead. "I am happy with that because I had to really battle very hard as my tyres were worn out by the end of the ninth lap and I was sliding all over the place," said the 37-year-old seven time world champion in the class. The race had to be reduced to 19 laps after it was halted following a brutal first-lap collision between French rider Loris Baz and Pol Espargaro of Spain. Baz, on a Ducati, and Espargaro on a Yamaha Tech3 were at the back of the field but debris from their bikes littered the corner and the track. Once the race got underway for a second time, Vinales made a superb start on his Suzuki to lead from Marquez with Crutchlow in third and Rossi fourth. Rossi produced a supreme passing movement with 14 laps to the chequered flag, relegating Marquez to third. Vinales was well clear of the pack and maintained his advantage of 2.5sec despite Rossi's best efforts. Marquez lost further ground as Crutchlow and Andrea Iannone passed him in quick succession with the latter then overtaking the Englishman and Rossi to move into second with eight laps remaining. Rossi fought back to take second again as an engrossing tussle took place for the minor placings with six riders involved. Iannone dramatically fell out of that equation when he came to grief with five laps to go while Marquez's overzealous attempt to pass Rossi saw him exit off the track but return just behind the Italian. The lead pursuer of Vinales was now Crutchlow, with arch-rivals Rossi and Marquez conducting their private duel behind him -- the Spaniard going past him with four circuits of the track to cover. Crutchlow staved off a stern challenge by Marquez for second spot in the closing stages before the latter also had to concede third place to Rossi.